These are classic, beautifully stamped Four Corners crosses suspended from domed, repousseé buttons. Vincent gave a light patina to the silver using an oxidizing agent. These go with all sorts of things--that you already had and that you've gotten from us. 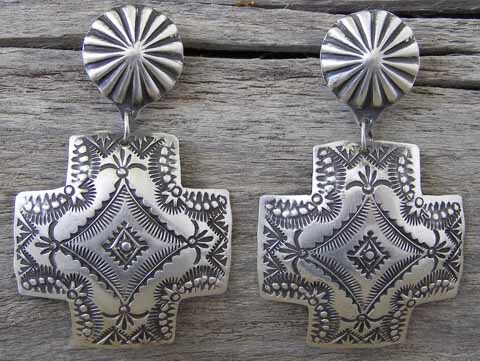 A classic Southwestern cross! Hallmarked VJP and stamped Sterling on the back of each cross. Dimensions of crosses: 1 9/16" x 1 9/16"